Joyce Rupp is well known for her best-selling books on spiritual growth, but she is also the author of numerous books on grief and consolation, including "Praying Our Goodbyes" and her recently published "Now That You've Gone Home: Courage and Comfort for Times of Grief", from which this booklet is drawn. Priced no more than a sympathy card, and easy to mail or carry in a purse, "May You Find Comfort" offers an elegant prayer and meditation in a beautiful layout, expressing the deep care and concern of the faith community. 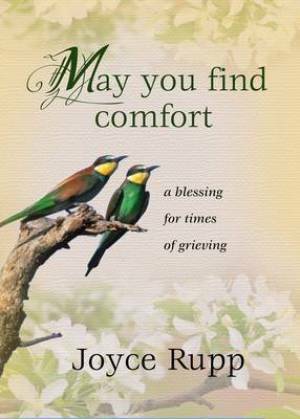 May You Find Comfort by Joyce Rupp was published by Ave Maria Press in April 2010 and is our 23212th best seller. The ISBN for May You Find Comfort is 9781594712449. Be the first to review May You Find Comfort! Got a question? No problem! Just click here to ask us about May You Find Comfort.